The number—and the proportion—of students enrolled in public charter schools (independently run public schools) is increasing nationwide, particularly in urban school districts. The public policy debate in education on the pros and cons of charter schools remains tenuous and divided. Market-oriented educational reformers favor charter schools as the answer to the problems in urban public school systems; public and private funds available for constructing and running charter schools continue to increase. However, charter schools have many critics. For example, in 2016 the NAACP and the Black Lives Matter Movement passed resolutions critical of charter schools and the privatization of public education overall. Complicating the charter school debate is the mixed academic achievement results seen among charters nationally. For example, a 2013 study from the CREDO Institute at Stanford University found that charter schools outperform traditional public schools (TPS) in reading and are comparable in math. In contrast, other researchers have found that charter schools affect enrollment patterns, segregation[ii], and performance[iii] in nearby traditional public schools. While most debates about charter schools focus on academic achievement, little analysis has looked at how charter schools may affect neighborhoods. It is well understood that school quality is an important factor in how households select neighborhoods in which to live[iv], but less is known about if and how charter schools affect neighborhood change and household location choice. For example, does the opening of a charter school draw households with relatively higher incomes, and distinct sociodemographic characteristics, to move into lower-income neighborhoods? Is the search for higher quality schools outside a household’s neighborhood the first step in eventual residential relocation? Are households with school-age children agents of neighborhood change, representing a new subset of gentrifiers? Are charter schools new institutions of gentrification? Or conversely, are they opening in already gentrifying neighborhoods? And whether they emerge before, after or during, what role might charter schools play in affecting neighborhood change? To explore these questions, I looked at Los Angeles, where charter schools are growing rapidly in number. The Los Angeles Unified School District (LAUSD), the second largest district in the country after New York City, has the most charter schools of any district nationwide (though not the highest proportion[v]). Between 1996 and 2013, startup charters went from one percent of all public schools in LAUSD to 21 percent, with 197 active schools. By 2011, charter schools in Los Angeles accounted for 12 percent of public school students and ten percent of public and private combined. Charter catchment areas account for about 72 percent of all census tracts within LAUSD and are located within the estimated attendance areas of 400 traditional public schools. I measured socioeconomic and demographic change—across space and time—associated with charter school growth in LAUSD from 1993, when the first charter school opened in the district, through the 2013 school year. For these years, I used a parallel approach, looking at census demographic data and public school administrative data to see how schools and neighborhoods were changing. The analysis focused on two overlapping areas during the period of study: charter school-influenced traditional public schools (TPS with at least one active charter school in their estimated catchment areas) and charter school neighborhoods (census tracts with at least one active charter school). The proportion of white students increased substantially more in charter school-influenced traditional public schools. At the same time, while overall proportion Latino substantially increased throughout LAUSD, it increased less in charter-influenced traditional public schools. Charter prevalence was also associated with smaller increases in the proportion of students designated as English Language Learners in traditional public schools. This indicates that the number of low-income, low-education migrant households is decreasing relatively more in charter neighborhoods. The study incorporated a parallel approach, measuring change at both the census tract level and within traditional neighborhood public schools. For the 20-year period between 1993 and 2013, I analyzed the sociospatial relationships between 757 traditional public schools, 222 startup charter schools, 935 private schools, and 1211 census tracts. The neighborhoods dataset includes US Decennial Census sociodemographic indicators at the census tract level. I focused on four metrics of neighborhood change, in line with the consensus from gentrification research: (1) household income; (2) housing values (as prices increase, the demographic who can afford them shifts, often pressuring current residents to move elsewhere); (3) racial/ethnic composition, including married-couple white households with school-aged children by race/ethnicity (these households would be the primary actors in neighborhood change associated with charter school growth instead of the typical young, single professionals typically associated with the phenomenon; and (4) educational attainment. For a detailed description of data and methods, see the full report. The parallel approach provides unique insights into important trends associated with the dynamics of socioeconomic and demographic neighborhood change in Los Angeles, in particular significant relationships with key indicators of gentrification—(1) household income; (2) housing values; (3) racial/ethnic composition; and (4) educational attainment. With few exceptions, the findings of each analysis confirmed the trends found in the others. Of the four most important indicators typically associated with gentrification, charter school openings, presence, and prevalence are significantly associated with two, demonstrating substantially greater increases in the proportion of white residents and housing values when compared to neighborhoods with no charter schools. However, they are only marginally associated with changes in median household income and education levels. I found that charter schools tend to locate in relatively lower-income, Latino and black neighborhoods compared to neighborhoods where no charters emerged. Relatively wealthier neighborhoods are less prone to change from gentrification pressures; by definition, poor neighborhoods are more vulnerable to sociodemographic change, and therefore gentrification and potential displacement of existing residents. However, I found no significant relationship between income and charter vs. non-charter neighborhoods. In both descriptive and multivariate analyses of census tracts, there was clear evidence significantly linking charter openings, presence, and prevalence to substantially greater increases in the value of owner-occupied housing. On average, prices increased 16 percentage points more in charter neighborhoods, while in neighborhoods with a charter school opening, the increase was on average 18 percentage points more. And for every additional charter school, values increased 5.5 percentage points more. The findings on the racial/ethnic composition of charter neighborhoods were the most significant and strongly supported across all four analyses (schools + neighborhoods and descriptive + multivariate). 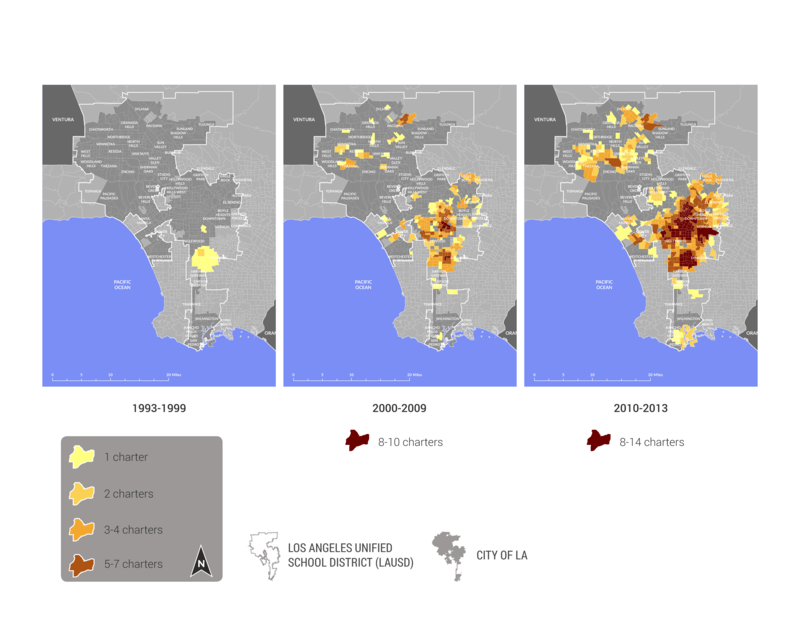 Both within traditional public schools associated with charter schools and in charter school tracts, the changes in the proportion of non-hispanic white were significantly greater during the period of charter school growth in LA (between 2000 and 2010, the proportion white increased 8.5 percentage points more in charter tracts than non-charter tracts, while charter openings were associated with a 10.6 percentage point greater increase and for every additional charter school, the proportion white increased 2.6 percentage points more). Additionally, tracts with charter closings demonstrated the opposite trend, with substantially greater decreases in the proportion white than in tracts with no charter closings (2.6 percentage points more). Moreover, areas with higher concentrations of charter schools had substantially greater increases in the proportion white. Following the trend of greater increases in the proportion of white residents in charter tracts, there were also significantly greater increases in the proportion of married-couple white households with school-aged children in charter neighborhoods (10.6 percentage points more), as well as significantly greater increases in areas with a high concentration of charters. The proportion of white students increased substantially more in charter school-influenced traditional public schools (38 percentage points for charter presence, 12 percentage points for a charter opening and for the presence of every additional charter school). At the same time, the proportion Latino decreased relatively more. Charter prevalence was also associated with smaller increases in the proportion of students designated as English Language Learners in traditional public schools. This indicates that the number of low-income, low-education migrant households is decreasing relatively more in charter neighborhoods (charter presence and prevalence are also associated with lower enrollments in traditional public schools, as well as less Academic Performance Index growth; these findings however point to inter-school competition instead of sociodemographic change in neighborhoods). 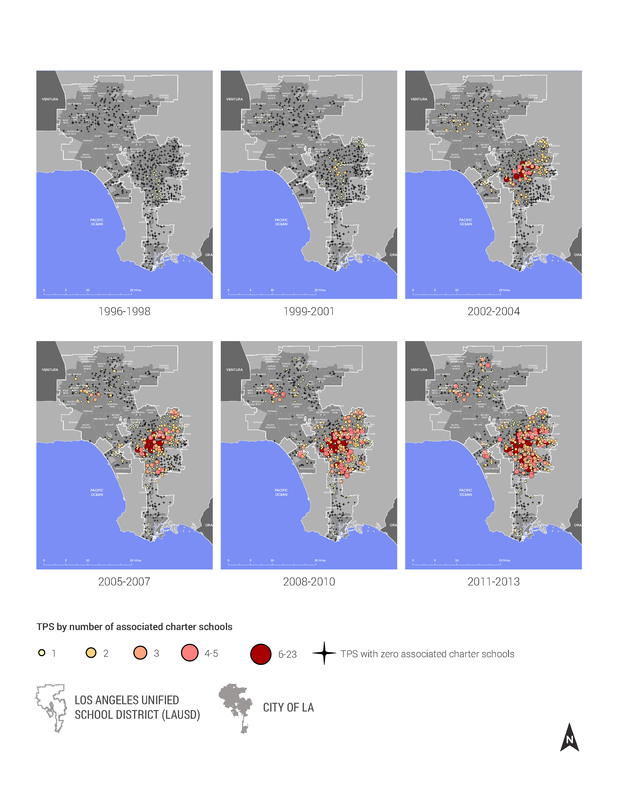 The findings indicate several significant, strong relationships between charter school openings, presence, and prevalence and socioeconomic and demographic trends associated with gentrification in Los Angeles during the post-2000 period. If new, higher-income households were electing to put their kids in local public schools—both traditional and charter—the implications of a link between charter schools and neighborhood change could be positive—education research on school integration consistently points towards improved educational and social outcomes for students. While the findings here did indicate a higher proportion white of residents and traditional public school students in charter neighborhoods, they do not indicate whether these changes equate to a greater degree of mixed-incomes or ethnic diversity among households and whether or not they displace lower-income households. While I found charter schools were located in neighborhoods with a greater increase in housing prices—and in the proportion white—no link was found between changes in income or educational attainment of households. Although the findings do not ascribe causality—what came first, charter schools or gentrification—they do establish the magnitude of change associated with charter school growth throughout LAUSD. Given the unclear patterns in the period prior to charter school growth in neighborhoods where they later emerged, I was ultimately unable to sort out the chicken from the egg. Just as charter schools have been linked to resegregation of public schools, charter schools may contribute to class stratification within neighborhoods by giving wealthier households the choice to opt out of traditional neighborhood schools. In short, as gentrification has not improved traditional neighborhood public schools, any link between charter schools and gentrification may have adverse effects on neighborhoods, along with any improvements in services, infrastructure, and degree of mixed-incomes among households (assuming limited displacement). While the findings establish a potential relationship between neighborhood change and charter schools, they pose more questions than they answer. Future research will likely prove fruitful as the number of charter schools—and longitudinal data that enables comparisons—continue to increase. It will be necessary to refine the spatial models used here from a simple binary relationship (neighborhoods and schools are/are not near charter schools) to a continuous measure across space (the closer a neighborhood is to a charter, the stronger the spatial relationship). A continuous relationship more accurately models the decision-making behavior of households with school-aged children, as unlike traditional public schools, which have attendance boundaries, charter schools can accept students from across the city. Relationships that emerge from this type of model have the potential to more definitively measure the relationship between charter schools and neighborhood change. Of course, fully understanding the relationship between changing neighborhoods and changing schools is no easy task. I would like to point out three important limitations to my research that future research should try to improve upon: (1) observed trends cannot signal the direction of a causal link—in other words, while I identified a relationship between gentrifying neighborhoods and charter schools, I could not establish which came first, charter schools or neighborhood change. (2) Unlike traditional public schools, students are eligible to attend charter schools regardless of their home address; the models for spatial influence of charters could not capture the potential effects of commuter students from another part of the district to the given neighborhood. And (3) many charter schools have a ‘mission to serve the underserved’, which likely weakens any empirical relationship charter schools may have with neighborhood change. This guest blog is based on Brock’s thesis research for the Master’s in Urban and Regional Planning at UCLA, completed in June 2015. The full thesis can be viewed here. He is currently working with Michael Lens, Associated Professor at UCLA, to expand his thesis research. Brock currently works at Calthorpe Analytics where he leverages data science and spatial modeling to inform land use policy and planning. Bifulco, Robert and Helen F. Ladd. 2007. School Choice, Racial Segregation, and Test-Score Gaps: Evidence from North Carolina’s Charter School Program.” Journal of Policy Analysis and Management 26 (1): 31-56. Bifulco, Robert, and Helen F. Ladd. 2006. The Impacts of Charter Schools on Student Achievement: Evidence from North Carolina.” Education Finance and Policy 1 (1): 50-90. Bayer, Patrick, Fernando Ferreira, and Robert McMillan. 2004. “Tiebout Sorting, Social Multipliers and the Demand for School Quality.” Working Paper 10871. National Bureau of Economic Research. http://www.nber.org/papers/w10871. Conversion charter schools were excluded because they tend to function more like traditional public schools than charters. See: Orlick, Jennifer. 2012. “Conversion Charter Schools: A Closer Look.” California: California Charter School Association. http://www.calcharters.org/CCSA_Conversions_Brief_2012.pdf. Zuk, Miriam, Ariel Bierbaum, Karen Chapple, Karolina Gorska, Anastasia Loukaitou-Sideris, Paul Ong, and Trevor Thomas. 2015. “Gentrification, displacement and the role of public investment: a literature review.” No 2015-5, Community Development Investment Center Working Paper, Federal Reserve Bank of San Francisco, http://EconPapers.repec.org/RePEc:fip:fedfcw:2015-05.